Toroid transformers, also called as Toroidal Transformer or Toroidal power supply are transformers having the shape of its core different than the conventional ones. Toroid transformer's core, as the name implies are toroids or called as Toroid Cores. Toroids are ring-shaped surface generated by rotating a circle around an axis that does not intersect the circle. It is a doughnut-shaped object enclosed by a torus. In general, toroids are used as an inductor in electronic circuits, especially at low frequencies where comparatively large inductances are necessary. Toroids has more inductance per turns, than other solenoids per unit volume and assuming the same core materials. This makes it possible to construct high-inductance coils of reasonable, which means small physical size and mass. Toroidal coils of a given inductance can carry more current than solenoidal coils of similar size, because larger-diameter wires can be used, and the total amount of wire is less, reducing the resistance . Toroids Transformer operates on the same principle as that of the conventional ones. But its the property of a toroid shaped core that makes the difference. 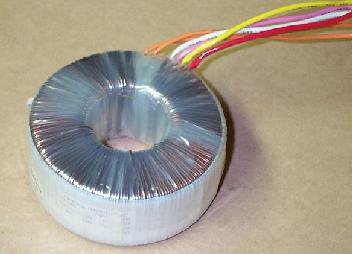 Toroidal Transformers are composed of coil of insulated or enameled wire that are wounded on a donut-shaped core. Toroid Transformer's core is made up of grain-oriented silicon-iron is slit to form a ribbon of steel which is then wound, like a very tight clock spring. The construction of its core allows the molecules to align with the direction of flux. This decreases reluctance. Compared to EI laminated cores, which are stamped from grain-oriented Si-Fe, core material in a toroidal can result in a size and weight reduction of up to half. It is important to note that Toroidal Transformers initial cost are higher cost per given kVA rating and have relatively higher inrush current compared to than that of laminated core type. Toroidal transformer construction also has relatively higher labor cost of winding. Toroidal transformers are uncommon above ratings of a few kVA. It could go as small as 1 or 5 VA and its biggest rating would be around 2 kVA. Small distribution transformers may achieve some of the benefits of a toroidal core by splitting it and forcing it open, then inserting a bobbin containing primary and secondary windings. High quality open style toroidal transformers with a single 240V A.C 50/60Hz primary winding. If ever you find some other links, we would be glad to be informed of such.